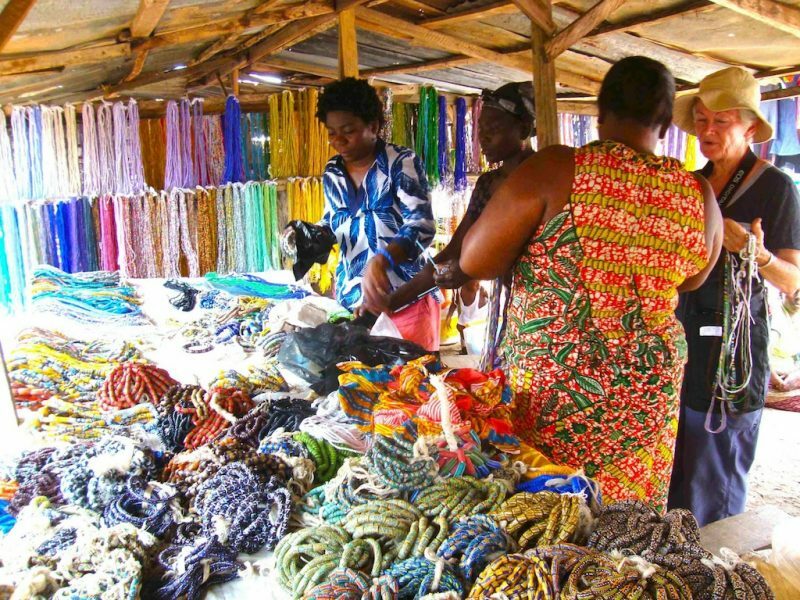 Hanouvi and Denise buy beads in Ghana’s huge Bead Market! Ghana is sometimes called “Africa for beginners” because of the ease of travel, the friendly, welcoming people and the relative level of modernity compared to other West African nations. 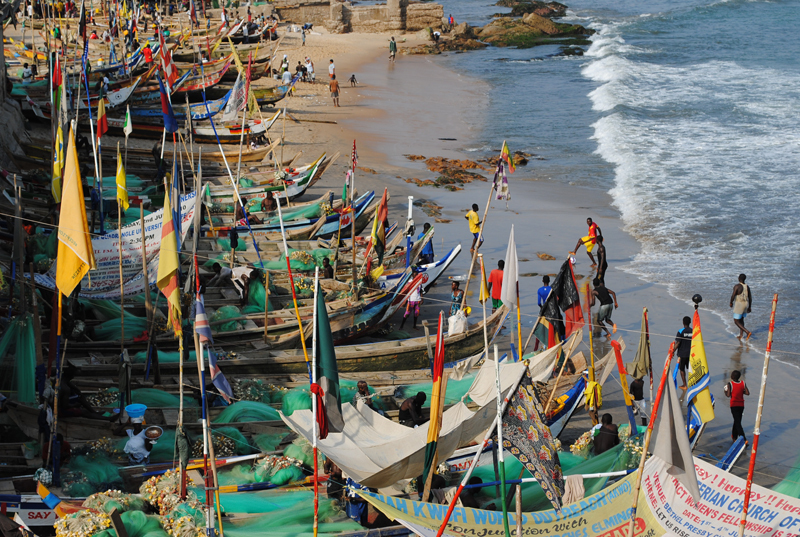 This arts and culture of Ghana tour includes three workshops of traditional crafts, an enormous bead market, fantasy coffins, a school visit, and the biggest fabric market in West Africa! Ghana is safe and politically stable; best of all, the people have retained many cultural and artistic traditions such as the patterned ‘kente’ weaving and Adinkra cloth – and have created some others, such as the fairly recent mode of fantasy coffins. This is not only a textile tour, but also an arts and culture tour of Ghana that explores the creative aspects as well as the historical and ecological features of this fascinating country. 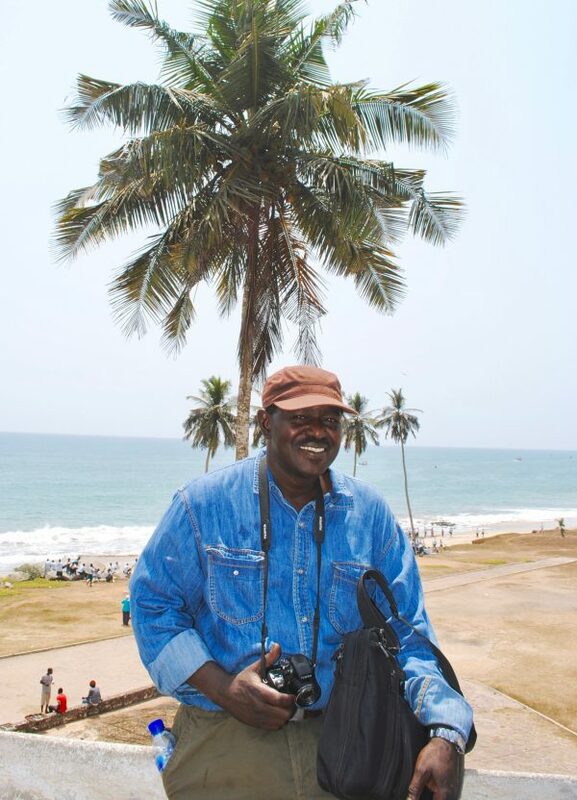 Led by Malian Barou Samake, this adventure includes the very best of Ghana! Barou is an upbeat leader with a positive, can-do attitude to ensure that your travel experience enchants and enriches you. 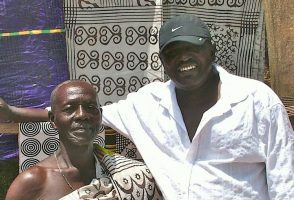 Our friend and Master weaver Jeff Ahiagble will accompany the tour in the kente cloth weaving centers. With Jeff’s help, you can also try your hand at weaving on a double-heddle kente strip-cloth loom if you like. Professional English-speaking local guides at historical sites will add depth to your knowledge by explaining the historical context and background of the sites. Expert Ghanaian artist-friends lead the three exciting workshops: batik stamped cloth, adinkra-printed fabric, and glass bead-making. There will also be time to make a necklace or bracelets with your beads. Elsa stamping her batik fabric with wax. You will be met by the trip leader and driver at Kotoka International airport, in the capital city of Accra, on February 7 when you arrive. We’ll go from ocean beaches to forest canopy, with lakes and traditional villages in between! On this wonderful adventure, we will cover as much as possible of the fascinating southern part of the country. We’ll spend several days in specific areas such as Kumasi, so that we get a good feeling for Ghanaian life away from the busy coastal areas. First we’ll head west to tour Cape Coast Castle with a licensed local guide. This important UNESCO World Heritage site was one of thirty large commercial forts built by European traders on the Gold Coast of West Africa (now Ghana). Originally it was built by Swedish settlers to trade timber and gold, but later used in the tragic trans-Atlantic slave trade. The historic town of Elmina is believed to be the location of the first point of contact between Europeans and sub-Saharan Africans. Barou Samake, Ghana tour leader. 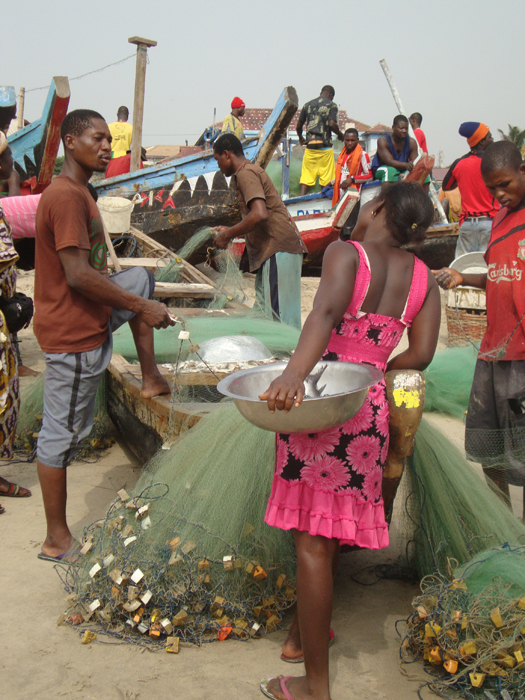 Now the town is a fishing village with colorful scenes of fishermen and boats on the beach. Next, we’ll head north to Kumasi, then Odumase, Ho and Denu, before driving back to Accra. At the end of the trip, we’ll stop in the fishing town of Jamestown, with its fresh fish market, tuna smoking ovens and fishing scene on the beach. We will meet with a friend who works there. He’ll show us the boats being crafted by hand, and will explain how the community/communal fishing works. He will also show us the school for the fishermen’s children (built by Canadians) and you can donate school supplies here if you wish. Kente weaving, batik printing, adinkra stamping and other arts such as music, dance, and bead-making are all thriving, alongside the modern aspect of the city of Accra. The famous Ghanaian kente cloth is still woven in several places; we will see the beautiful patterns of both Ewe and Ashanti versions. We’ll meet the weavers in individual and coop settings to see weaving demonstrations. Also you’ll be able to buy their work directly from them. In this area, a friend and master weaver will accompany the group to the weaving market and will show you his working techniques. We’ll try our hand at some traditional crafts in several half-day workshops mentioned above. 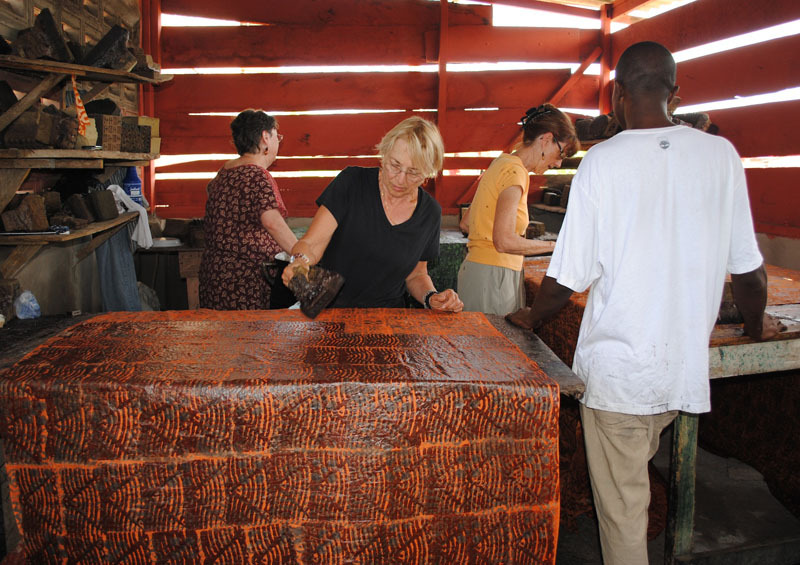 We will print adinkra motifs made from sections of hand-carved dried gourd to embellish cloth. Another day we’ll stamp hot wax on cotton yardage for a gorgeous batik and also we’ll make recycled glass beads. At a fabulous weekly Bead Market, dozens of stalls hold an amazing variety of handmade beads, available for great prices. Later we’ll create necklaces and bracelets from our handmade beads and newly acquired ones. These workshops represent typical arts and culture of Ghana that are being both maintained and re-invented by the artisans. 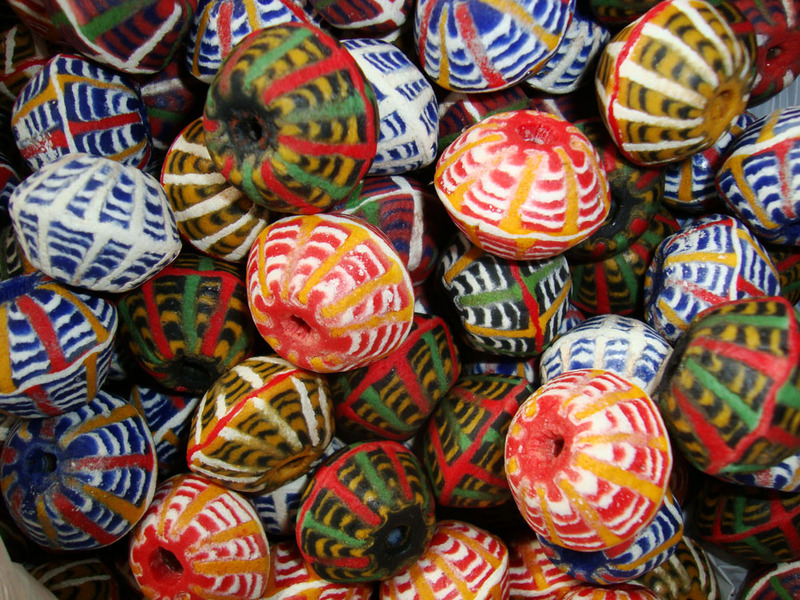 Powdered glass beads made by Cedi, available at his shop. We will visit a coffin carving workshop, to see what they are working on. These wooden, custom-made coffins reflect the career or aspirations of the deceased, for the Ga ethnic community. Fishermen might be buried in a huge colorful fish or a carpenter in a big hammer-shaped coffin! Ghanaians can request burial in a carved wooden version of their favorite automobile, or airplane. Farmers can order cocoa pods or chili peppers for the journey to the other life. Some men choose a beer bottle or an over-sized Coca Cola bottle. Popular women’s coffins include huge chickens, with smaller wooden “chicks” at her feet, one representing each of the lady’s children. We’ll see the coffin construction and carving process and different models. ‘Fantasy coffins’ have become art pieces in America, bought by galleries and collectors. See our friend Eric’s fantasy coffin creations here. 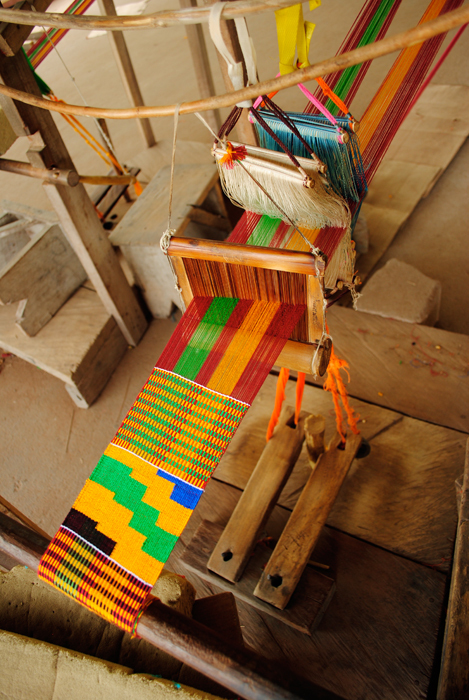 Kente strip loom, showing the foot pedals. We’ll also stop at the rural school that we have ‘adopted’ to offer school supplies that the group brings. These kids are adorable and have almost no school materials, but the principal is wonderful as are the hard-working and very appreciative teachers. Bring an empty suitcase to hold all the amazing roller-printed fabrics you’ll discover in the overflowing markets! We will go on a special market tour in Kumasi with a friend who knows the labyrinth of stalls and where to find the best fabrics – and whatever else you may need – great fun! Arrive on February -and fly home from Accra on February -. February 20 is LAST included night of hotel but you may leave your bags, and hang out at the hotel, until time to go to the airport. Many flights leave Accra late at night. We have a project to help local schools where we travel; we’ll visit an elementary school in a remote area in Ghana and offer school supplies. BTSA travelers have been wonderfully generous about donating pens, pencils and notebooks during our visits, and the children are so sweet; this is really a heart-warming experience!! See the BTSA Helping page here. Girl selling fish takes a break to flirt! 14 nights accommodation in comfortable local hotels (double rooms), transportation by private vehicle, all meals, except one lunch on last [free] day in Accra, all soft drinks and water with meals, bottled water in the van on the road; airport transportation on group arrival and departure days, all entrances to historical sites and museums on itinerary, professional guide at Elmina Castle, expert shopping guide for Kumasi market tour, Master Kente cloth weaver guide, three workshops: glass-bead making, Adinkra stamping, and batik printing – 2 yards of cotton cloth are provided for the batik printing workshop. International airfare to the capital, Accra; (simple to procure) visa for Ghana ($100); personal items such as laundry, between meal water and snacks, and the cloth to print Adikra on. There will be a group market outing in Kumasi to buy your choice of cloth for Adinkra printing. Batik cotton included for wax printing workshop. If you arrive or depart on a different day than the designated group arrival/departure date, you will need to pay the taxi from airport to hotel, and any additional nights of hotel. Plan flights to arrive after 10am or before 8pm if possible. Barou will meet you at the airport, with the driver on the group arrival date. Otherwise, we will arrange for the hotel to send a known and safe taxi driver for you. The Ghana airport is enclosed and fairly un-chaotic. Fishing boats in the harbor. After you have paid the $500 deposit for Arts and Culture of Ghana, and several months before departure, we will send you the form to fill out for your visa to Ghana, and an information packet with lists of what to bring, heath and cultural info, maps, etc. It is impossible to plan attendance at traditional musical or dance events or even holidays and festivals, from afar. We love these events, and we’re happy to be flexible and spontaneously attend traditional performances in villages along the way, if the chance should arise. See the Ghana Image Gallery here.